I’ve heard absolute horror stories about what happens when a pregnant woman informs her employer about her pregnancy. Women are forced into quitting, fired or shamed so frequently you would think that’s the law. Well, it’s not. You have rights, but don’t assume your employer will inform you of those rights. Many companies just aren’t here for women like that or soon-to-be dads for that matter. Still, it’s important to know your pregnancy rights at work. So let me give them to you straight from the Equal Employment Opportunity Commission. Your employer cannot legally fire you because you’re pregnant. You can’t be turned down for a job or promotion, forced to take leave or given fewer responsibilities because you’re pregnant, and that protection doesn’t just cover you if you’re pregnant. Your boss can’t fire you because you intend to become pregnant, have a medical condition related to pregnancy, had an abortion or even are considering having an abortion. The company can’t couch a termination in concern for you, but note it can give you the boot if you pose a safety risk to other people or you are unable to do your job. Even if you can’t work, your job may still be safe. If you’re under a doctor’s orders not to work, your company may have to hold your job for you, even if you don’t have paid leave. In that scenario, you wouldn’t be collecting a check, but at least you wouldn’t have to worry about losing your job. Your leave may also be protected under the Family and Medical Leave Act and by state laws, which in some cases go much further than federal law does. Be sure to check. Your company may have to accommodate you if you can’t fulfill all your job tasks the same. That may mean altered break and work schedules, breaks to use the restroom, permission to sit or stand, “ergonomic office furniture,” shift changes, reduced responsibilities if they’re marginal or permission to work from home. Basically, the rule is if your job has made similar accommodations for employees who aren’t pregnant, you should get the same courtesy during your pregnancy. Your employer does however, have the right to pick an accommodation for you if more than one would fix the problem. You may be entitled to the same protection as someone with a disability. Don’t belittle your pregnancy-related medical condition or think you have to cope alone. Your company may bear some responsibility, and I’m talking conditions ranging from cervical insufficiency and preeclampsia to anemia, gestational diabetes and depression. The condition doesn’t have to be permanent or severe. It just has to be substantially limiting when symptoms occur, and accommodating you can’t cause significant expense or difficulty for the company. You don’t have to put up with harassment. Report the harassment, and work your way through your company’s protocol on the issue. “If you report the harassment, your employer is legally required to take action to prevent it from occurring in the future,” the EEOC says. You have the right to pump. Companies really should know better, but you’d be surprised how many do not. So plan with your company as much as possible. Ask for what you need, even if you don’t know specifically what you need. I know it’s not always easy to ask a male boss about topics as private as a place to pump. I felt particularly uneasy, so I asked one of my female bosses in an email. She directed me to another person. But because I was uncomfortable tracking down and asking a stranger about personal needs, I didn’t follow up for weeks. I avoided the topic, and I only revisited the conversation the very day I returned to the office after giving birth. Talk about pressure. Luckily, my company had a whole system already in place, but that’s not always the case. Some companies may need a heads up that they’ll need to come up with a space for you to pump. Others may think finding a place to pump is your responsibility. They are wrong, and you may have to advocate for yourself. In both scenarios, it helps to start early. Even if you can’t find the right wording or course of action, drop a comment to this post. We’re a community of moms. We can help or at least find you a contact who can help. If you’ve done everything you can do to get your company to adhere to the law but it still isn’t cooperating, contact the Equal Employment Opportunity Commission. Contact them soon, and follow up. “You must file a charge within 180 days of the alleged violation in order to take further legal action,” the EEOC says. If you have questions you can visit a local EEOC office or otherwise reach the commission by calling 800-669-4000 or 800-669-6820. 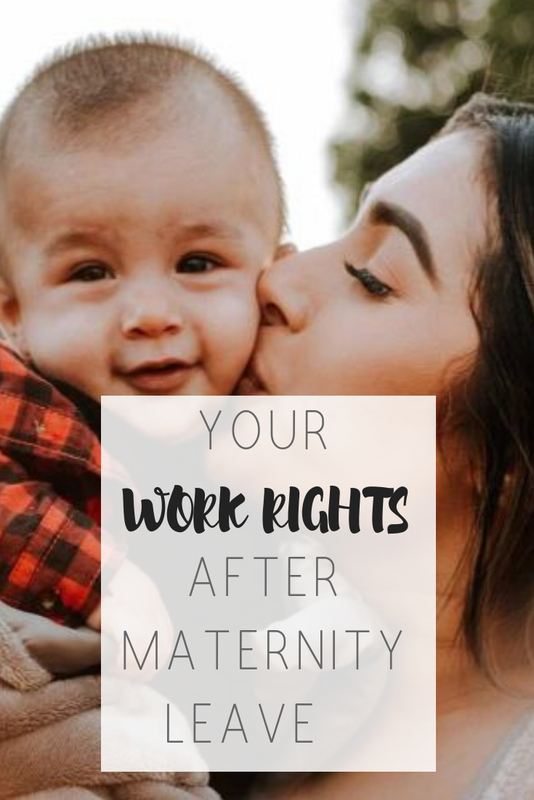 Know your pregnancy rights at work | Honeycomb Moms | Whether you call them pregnancy rights, maternity rights or workers’ rights, know that you are entitled to certain allowances in this country that your employer might not necessarily tell you about or even be aware of. So read more to learn your work rights after maternity leave. That’s beyond immoral. How did you handle it? I’m so glad I didn’t have to worry about this when I was pregnant with my daughter. We former job had a pretty good maternity leave. Thanks for sharing this information, it’s inportant for us to know our rights as women. Some employers can be really silly! Thanks for sharing this. I think never wanting kids and also being self-employed I never considered what this concern looks like for other women. Great tips! I could have used this as a resource when I was pregnant working temporary jobs. I love that you shared this for parents to be. I had a great pregnancy-work experience and can only imagine the struggles. It’s so good to know your rights, especially as a career woman! Thank you for making this highly informative post. Very good advice for expecting women. Can you elaborate and explain this sentence, “The company can’t couch a termination in concern for you, but note it can give you the boot if you pose a safety risk to other people or you are unable to do your job.” thanks! For example, this is a no-no- I’m worried performing this job is not healthy for you, so I’m going to have to let you go. But assuming it’s true, this is legal- You pose a safety risk to others, so we’re going to have to let you go.